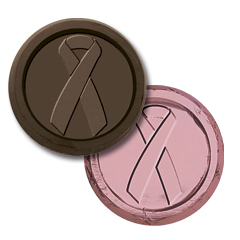 Raise awareness for breast cancer with our delicious Belgian DARK chocolate coins. Our popular bite-sized dark chocolate coins arrive wrapped in pretty pink foil with the pink Breast Cancer Ribbon logo imprinted on each one. Each dark chocolate coin measures 1.5" and weigh .25oz. A DELICIOUS way to raise awareness. Sold by the case of 250 chocolates. **Please note that during the months of May - Sept chocolates must be shipped via 2 day air, on ice.